Traveling presenters. Traveling sales people and tutors will find the IN1118HD's blend of low weight, small size, high brightness, and full HD resolution hard to beat for presentations that need highly readable text or finely detailed graphics. Its ability to read files from internal memory and USB memory keys also means you can leave your computer at home. And if you're on the road, it can serve nicely for watching a movie in your hotel room afterward. An optional USB dongle even adds Wi-Fi, web browsing, and whiteboarding. Casual Home Entertainment. When you're not using it for presentations, the good video quality, a surprisingly bright image for the size, and a 33 ms lag time make the IN1118HD spot on for an occasional indoor or backyard movie night or casual video gaming. 10,000 hour lamp life -- extraordinarily long. Optional LightCast USB dongle adds projector-based whiteboarding (using a mouse connected to the projector) and Wi-Fi both for Web-browsing through a Wi-Fi connection to a network and for connection to phones, tablets, and PCs using AirPlay, Miracast, or a Chrome browser extension. Physical attributes. The ports are all near the top of the back panel, with the power connector on the lower left of the back and the Kensington lock slot on the lower right. There is no security bar. The intake vents cover most of the left side panel as viewed from behind, and the exhaust vents are on the front panel, at the right side as viewed from behind. The control panel is on the top, near the back. Our test sample in its brightest preset mode fell about 10% short of its 2400 lumen rating, but even with that shortfall it still puts out more light than any other 1080p model in the sub-4 lb class at the moment. Low Lamp Mode. There are not two lamp power options as there are on most projectors. There is a Power Saving Mode option in the menus that shows as On, but there is no way to change it. In its fixed configuration, InFocus says the lamp life is 10,000 hours, so you could think of it as being permanently in eco mode. Presentation Optimized Lumens. If you need maximum brightness for a large screen or high level of ambient light, both Bright mode and the closely matched Blackboard mode offer usable color with the highest brightness. However, Presentation mode without any adjustment offers far better color quality and the best balance between color and brightness for presentations, with about 960 lumens. Video Optimized Lumens. Video mode without any adjustments offers the best color quality for video, at about 850 lumens. Zoom Lens Effect on Brightness. The telephoto end of the 1.3x zoom lens curtails light by 18%, dropping the ANSI lumens in Bright mode from 2160 at the wide angle setting to 1771 lumens at the maximum telephoto setting. Brightness Uniformity. The measured 51% brightness uniformity is lower than most projectors manage, with the bottom of the image brighter than the top and the center brighter than either side. The difference is enough to see easily when projecting material with a white background such as text documents and spreadsheets. It comes across as a bit of a hot spot at the bottom center of the image. However most people acclimate to minor hot spots like this without finding them bothersome. With more complex images like color graphics, photos, and video, the low brightness uniformity is more difficult to see and is not a distraction. Input Lag. With the default settings, our test unit showed an input lag of 33 ms in all preset modes. On-board audio. The 2-watt mono speaker delivers barely high enough volume for a small, quiet room, but it's enough to be serviceable for presentations that don't require high-quality or high volume audio. For those that do, you can connect an external sound system to the audio output. Fan Noise. Since the IN1118HD has such an unusally compact design for the brightness and resolution there are no directly competing models to compare noise levels with. However, the fan noise is consistent with what you would expect from somewhat larger units,. It is rated at 27 dB which is quieter than one would expect for its size and brightness. Using the same point of comparison, High Altitude mode, which InFocus recommends using at 7000 feet, is also a bit quieter than you would expect. Throw distance. The 1.3x zoom lens translates to better than typical setup flexibilty for a mobile projector, as it is rare to find a 1.3x zoom on a product of this size. The IN1118HD throws a 120" 16:9 picture from a distance of 10 to 13 feet. To find the throw distance range for the image size you want, see the Projection Calculator. Vertical Offset. 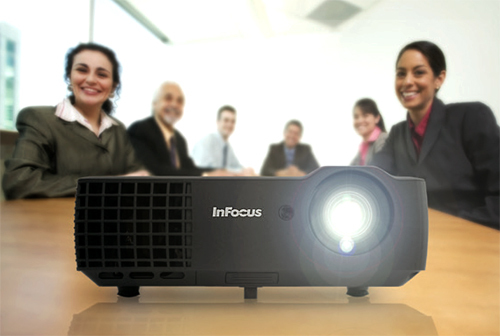 The lens offset is designed to work well with the typical placement of a mobile presentation projector on a conference table. At the native 16:9 aspect ratio, the bottom of the image for the test unit was 14% of the image height above the centerline of the lens. If you need to tilt the projector upward to raise the picture even higher, you have the option to adjust vertical keystone manually or turn on the auto keystone feature. 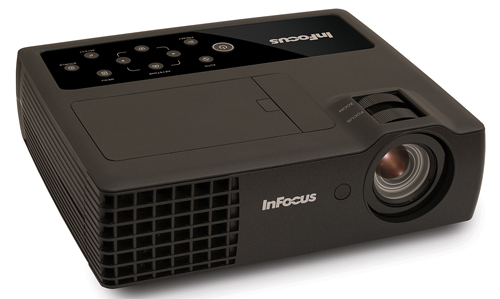 The InFocus IN1118HD is in a class by itself at this writing, pumping over 2100 lumens of 1080p resolution pictures out of a 3.5 lb. box. It can light up a 135" screen in moderate ambient light. Along with portability--aided by the supplied padded carrying case--it delivers crisp detail to make text in spreadsheets and document images easy to read and complex line drawings easy to decipher. It even handles video well enough to let you watch a full-length movie. Setup is easy, thanks largely to the 1.3x zoom--an enormous range compared with most mobile projectors--and vertical keystone. For traveling presenters who need high resolution and high brightness along with portability, the IN11118HD belongs on their must see list. As a final bonus, the anticipated 10,000 hour lamp life will mean many users will never need to replace the lamp, especially if it is being used for traveling presentation. If you do anticipate heavy usage of many thousands of hours, it is easy to budget for the replacement lamp which is $229 from InFocus. You can get the IN1118HD in its basic HD version for $1149 and add the optional $299 LightCast Wi-Fi dongle later, or buy it as a package in the HDLC version at $1,299 with the dongle included. Either way, it is a unique and excellent offering for anyone engaged in traveling presentation work. I ordered one of these based on this article's recommendation. The unit had a substantial flicker right out of the box on all images regardless of input or brightness setting. It was like a fluorescent light that was about to die out. Infocus sent me a new unit as an exchange. The replacement unit, the second I turned it on, I thought was about to explode. It made horrible loud electrical scratching and wailing noises, again regardless of input. Loud enough you couldn't hold a conversation next to it. Even when I turned it back to standby mode (off but plugged in) it kept making noises. 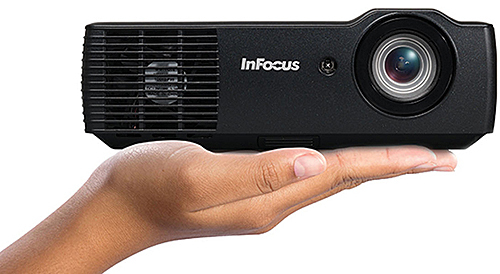 Clearly infocus is having some quality control issues with this model. So I'd steer clear for a while. Oh, by the way, having extensively used Miracast devices of all sorts over the last few years, I found the Infocus "Lightcast" dongle to be a waste of the $150 increased purchase price. The Microsoft Wireless Display Adapter is $50 and works far more smoothly and reliably in just as small of a form factor. The only thing extra Lightcast does is Airplay, which is cool, but if you're using typical corporate wifi which isolates guest wifi clients, you won't be able to use airplay unless you set the Lightcast to "access point" mode, then connect your iPhone to the projector's wifi... at which point you lose all internet connectivity on your phone.